After being a loyal subscriber to Ipsy for over two years, I decided it was time to give another makeup subscription box a chance. Boxycharm is similar to Ipsy. Each month you get full size or deluxe-sized products delivered right to your door, and I was sold after checking out their previous boxes. If you're not very adventurous with makeup like me, it's a great way to build your makeup collection on the cheap and expand your makeup expertise! 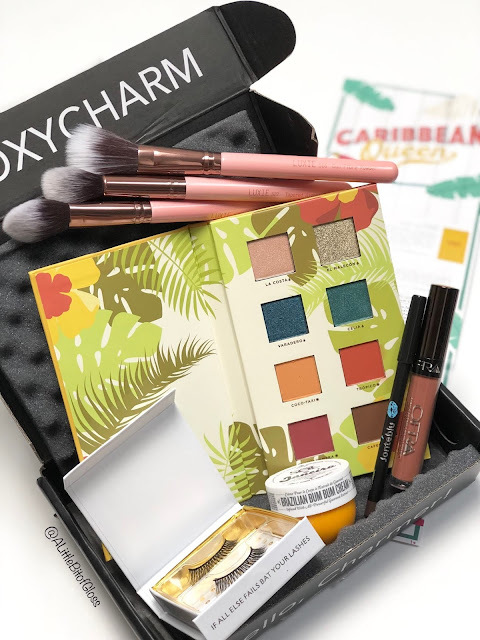 The June 2018 Boxycharm theme was Caribbean Queen and this just might be my favourite box so far. The box was almost bursting at the seams, and I was delighted to get the Alamar palette that I've been eyeing since its release a couple months ago. I'm also very happy to get the lashes since I wanted to get better at putting them on. Most of the time I just give up and put on extra mascara when I can't be bothered with putting falsies on, but I really like the way they look when you take pictures. I rate the June Boxycharm box a 5/5. Click here to sign up with Boxycharm to get a haul like this for yourself! Alamar Reina Del Caribe eyeshadow palette- I was thrilled to see that this box featured the first palette from Alamar Cosmetics. I was expecting nothing short of amazing! 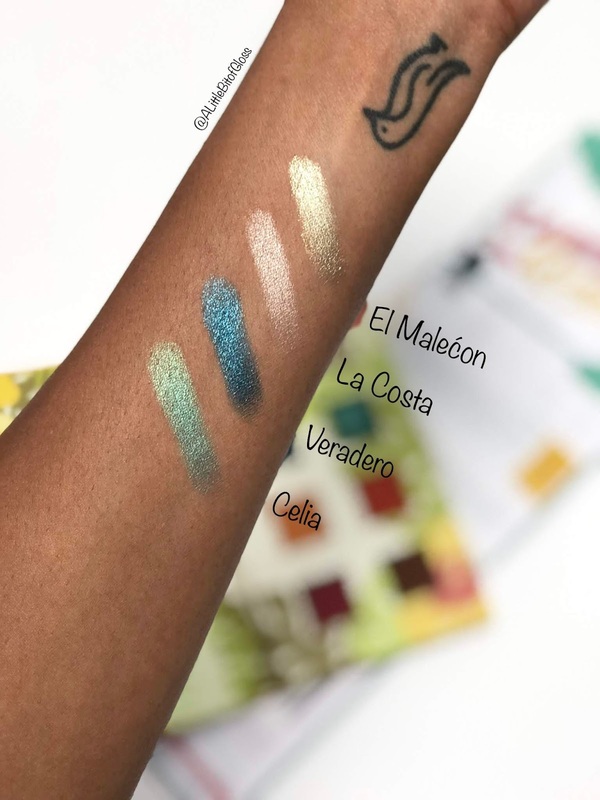 I was really impressed with how intense yet smooth the metallic shades were, but I noticed I needed to use a lot of product to see some pigment with the matte shades. Once I figured out how much I needed to use, the mattes blended nicely so be warned that there is a bit of a learning curve with this palette. You'll notice that the first four shades have a water drop icon next to the name. This means that the shade can be used with a wet brush. The last four shades have a sun icon next to the name, which means that these shades should be used with a dry brush. 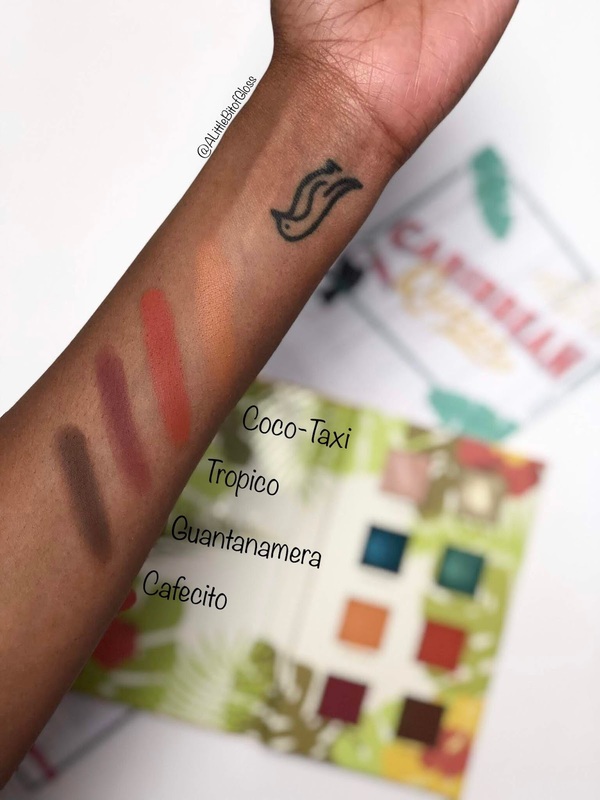 Out of all the palettes I received from Boxycharm, this one is in my top five because of it's versatility and fantastic pigment once you get the hang of it. Battington Monroe silk lashes- I love looking glamorous, but there is a such thing as too much glam which is why I'm a bit hesitant when it comes to falsies. That's why I love the Battington Monroe silk lashes because they look natural but still soft. I usually don't splurge on falsies so knowing this pair can last up to 25 applications is very useful. I like that these lashes are 100% silk and really adds volume and length without being too dramatic. Luxie 3 piece Flawless Complexion set- I've gotten so many Luxie brushes in the past little while, but I'm certainly not complaining. This 3 piece set includes some must haves for your beauty bag. I got the foundation face brush, highlighting face brush, and fibre powder brush. Luxie brushes are cruelty free and are always super soft. LOVE! Jonteblu waterproof eyeliner pencil- There's something about a simple eyeliner pencil that is just so comforting. Maybe it's because there's no fuss and almost no experience required! I like Jonteblu eyeliner pencils because they are so creamy and pigmented. The pencil glides across my lids with very little effort. It can't get any better than that! Sol de Janerio Brazilian Bum Bum cream- I was impressed with the formula of this cream and the fragrance is so so heavenly since it's a mix of pistachio and salted caramel. The sample is a bit small so I don't think I'd get much use out of it. If you're looking for a luxe all over body cream than this is a must try. It absorbed well and has so many skin loving ingredients like coconut oil, guarana extract, açaí oil and more. Ofra liquid lipstick- I've become very picky with my liquid lipsticks lately but I was happy to try something new. I've heard so much about the Ofra brand and I was already a fan of the brand from when I got the Ofra blush from another box a while back. The formula is exceptional and I like the doe-foot applicator because I'm a fan of clean, sharp lines when it comes to lip products. The June box is my favourite box from Boxycharm so far this year :) Tell me, fellow charmers...did you like your June box? If so tell me what your fave item from the box was and why. I'd love to hear from you!